Are you looking for the perfect gift for that perfect garden fanatic, your perfect landscaper, or just plain anyone on your list that can’t stand their old garden hose? This post was originally written by the wonderful Jennifer Shanley. The post is so popular that I it’s become Perfect Garden Hose tradition to share it in the beginning of December, and this is year three!! If you’ve seen the post three years in a row my apologies, but for any new readers you must let me know if you try it. 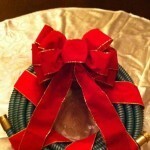 So back by popular demand, here’s how to make your own Perfect Garden Hose Wreath. 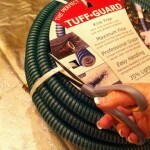 First, get your Perfect Garden Hose at on of these great retailers. Our 50′ Perfect Garden hose is available in blue, red, green, beige, grey & pink. Obviously we recommend using the green color for your Perfect Wreath. Next, carefully remove the packaging from your hose. 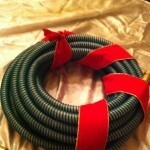 But, hang on to it so you can show your lucky recipient that this is no ordinary garden hose! 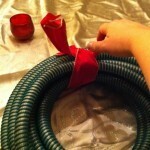 Once you’ve removed the packaging use a two-inch ribbon in the color of your choice (we used Red with gold trim), tie the ribbon around The Perfect Garden Hose and secure with a knot. This knot will not show once you have applied your bow. Next, start at knot and carefully wind your ribbon around your Perfect Garden Hose, leaving one to two-inches of space between the ribbon for it to show through. 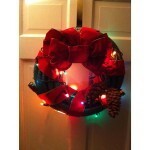 Finally, hang your Perfect Garden Hose Wreath indoors, outside or present as the Perfect Holiday Gift. 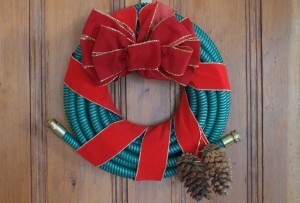 Share your own Perfect Garden Hose Wreath creations with us on Twitter and on Facebook. Why The Perfect Garden Hose? Glad you asked! JGB Enterprises has taken their 30+ years of experience with hoses for military, and industrial applications, and created The Perfect Garden Hose – a professional grade hose, brought home to you! 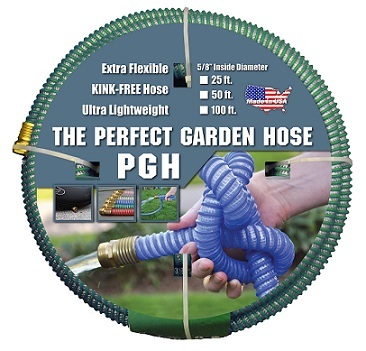 This revolutionary, made in the USA hose won’t kink, is super-lightweight and extremely durable. This isn’t just a hose; it’s the last hose you’ll ever need! Get one now for everyone on your holiday list! Happy Holidays! As always don’t forget to sign up over there to the right for regular Perfect Garden Hose updates, and all things garden hose related! This entry was posted in Birds, Boater, Car Buff, DIY, Gardening Tips, Homeowner, In the News, Indoor Gardening, Industrial, Landscaping, Pet Owners, Reviews & Testimonials, Uncategorized and tagged Associated Press, christmas gifts, Cool Christmas Gifts, DIY, diy christmas gift, Facebook, Garden hose, gardener, gardening christmas gifts, Google, holiday wreath, Instagram, Pinterest, the perfect garden hose, Twitter. Bookmark the permalink.